In a recent post, we looked back at the last year’s publications on the Pastorals. Here, we’ll take a look at some forthcoming titles — expected publications whose date of release ranges from less than a month away to over a decade in the future. Most are monograph-length publications, with a few others sprinkled in for good measure. My deep thanks goes to a number of authors who helpfully were able to provide a short description of their work, and publishers who responded to inquiries about forthcoming titles! If you are aware of other forthcoming academic work on the Pastorals, please leave a comment. The list given below is provided in pdf format (hyperlinks included) here. Bray, Gerald. Bray’s work on the Pastorals will appear in the International Theological Commentary, a newer series produced as a sort of companion series to the International Critical Commentary. ITC series webpage. Brown, Michael I. 2 Timothy. Lectio Continua Expository Commentary on the New Testament. Dallas, GA: Tolle Lege, forthcoming. Ebojo, Edgar Battad. “A Scribe and His Manuscript: An Investigation into the Scribal Habits of Papyrus 46 (p. Chester Beatty ii – p. Mich. Inv. 6238).” PhD thesis, University of Birmingham, 2014. The question of whether the LTT could have been part of P46 receives extended attention on pp. 204–35. The author plans to publish the work, though no immediate plans have been made for publication; the quality of the work, however, suggests there will be no problem in finding a publisher. In the meantime, the thesis is publicly available here and supplemental information here. Fitzgerald, John T. The Pastoral Epistles: A Commentary. Hermeneia. Minneapolis: Fortress, forthcoming. Fitzgerald’s work will replace the important Dibelius/Conzelmann volume in Hermeneia, and is slated for release in the late 2020s, over 50 years after its predecessor’s publication. Anyone familiar with Fitzgerald’s previous publications will rightly expect his Pastorals commentary to give special attention to the letters as distinctly Christian documents within the broader context of the Greco-Roman world. Gatiss, Lee, and Bradley G. Green. These two scholars are preparing the volume on the Pastorals in the Reformation Commentary on Scripture series. Downers Grove, IL: IVP Academic, forthcoming 2019. Hall, David W. 1 Timothy. Lectio Continua Expository Commentary on the New Testament. Dallas, GA: Tolle Lege, forthcoming. Herzer, Jens. “The Epiphany of God and the Coming of the Messiah: Reading the Septuagint with the Pastoral Epistles.” In Epiphanies of the Divine in the Septuagint and the New Testament: V. International Symposium of the Corpus Judaeo-Hellenisticum Novi Testamenti, 14–17 May 2015, Nottingham. Edited by Roland Deines and Mark Wreford. Wissenschaftliche Untersuchungen zum Neuen Testament. Tübingen: Mohr Siebeck, forthcoming 2019. Publisher volume description. Houwelingen, P. H. R. (Rob) van. 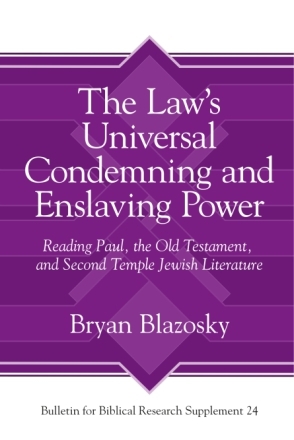 “Power, Powerlessness, and Authorised Power in 1 Timothy 2:8–15.” Forthcoming in Power in the New Testament. Edited by A. B. Merz and P. G. R. de Villiers. Leuven: Peeters, 2019 or 2020 projected. This essay is presently available here, along with a summary of its contents. Hultgren, Arland J. “The Pastoral Epistles and the Scriptures of Israel.” In Paul and Scripture. Edited by Stanley E. Porter and Christopher D. Land. Pauline Studies 10. Leiden: Brill, [February] 2019. Hutson, Christopher R. The Pastoral Epistles. Paideia Commentaries. Grand Rapids: Baker, forthcoming [November] 2019. Publisher’s description: “Among commentaries on the Pastoral Epistles, this one is distinctive for its emphasis on ministerial formation. While considering the particular features of each individual letter, Hutson reads these three letters collectively as an epistolary handbook for young ministers. The ‘Theological Issues’ sections often discuss how aspects of these letters inform Christian ministry. “Hutson’s exegetical analysis explores how the letters reflect an early Christian community still close to its Jewish roots and living in a Greco-Roman society that is always uncomprehending and often hostile. He applies James Scott’s ‘hidden transcript’ theory to show how Pastoral Paul’s advice helped Christian communities deflect suspicion and establish positive engagement with the wider society. Hutson’s approach is fruitful for understanding ethical issues in these letters, including teachings about slavery, women, and the ethical expectations of Christian leaders. At the same time, Hutson resists a hermeneutic of suspicion that views these letters as hopelessly patriarchal and written to inculcate Roman domestic values as normative for Christian churches. Hutson mounts robust arguments against discrimination on the basis of gender, ethnicity, or social class, but he does so from the Christological and eschatological warrants that he finds to be driving the letters. Jeon, Paul. 2 Timothy. Eugene, OR: Pickwick, 2020 projected. MacLean, Malcolm. Titus and Philemon. Lectio Continua Expository Commentary on the New Testament. Dallas, GA: Tolle Lege, forthcoming. Merz, Annette. “‘New’ Woman? Bruce W. Winters These und ihre Rezeption in der exegetischen Diskussion kritisch beleuchtet.” Pages 209-34 in Frauen im antiken Judentum und frühen Christentum. Edited by Jörg Frey and Nicole Rupschus. WUNT 2. Tübingen: Mohr Siebeck, forthcoming [May] 2019. Publisher volume description. Merz, Annette. Merz is preparing for publication an expanded English-language version of her article “Gen(de)red power: Die Macht des Genres im Streit um die Frauenrolle in Pastoralbriefen und Paulusakten.” HTS Teologiese Studies 68.1 (2012): 71–80. Nel, Marius. 1–2 Timothy, Titus. The Story of God Bible Commentary. Grand Rapids: Zondervan, forthcoming. Stanley, Steve. 1 & 2 Timothy, Titus. Evangelical Exegetical Commentary. Van Neste, Ray. Van Neste is working on the Pastorals volume in the Exegetical Guide to the Greek New Testament series. Nashville: B&H Academic, forthcoming. Wieland, George. “Sin and Its Remedy in the Pastoral Epistles.” Wieland will be contributing this chapter to a publication (edited by John Goodrich and Nijay Gupta) which collects and supplements the work of a recent IBR study group on Sin and Its Remedy in Paul. Projected publication date: 2019. Zamfir, Korinna. “Eusebeia, Sōtēria and Civic Loyalty in the Pastoral Epistles.” In “Make Disciples of All Nations”: The Appeal and Authority of Christian Faith in Hellenistic-Roman Times. Edited by Loren T. Stuckenbruck, Beth Langstaff, and Michael Tilly. Wissenschaftliche Untersuchungen zum Neuen Testament 2/482. Tübingen: Mohr Siebeck, forthcoming [March] 2019. Publisher volume description. In addition to the above publications, Jermo van Nes is editing the presentations from the recent conference held in Leuven, Belgium (program) titled “The Pastoral Epistles: Common Themes, Individual Compositions?” They are forthcoming in an issue of Journal for the Study of Paul and His Letters. Additionally, the proceedings of the Mainz “Ethics in Titus” conference, organized by Ruben Zimmermann and Dogara Ishaya Manomi, are planned for publication in the WUNT series. The Pastoral Letters in the New Testament all indicate, one way or another, that the church must expect to be constantly infected by misbelief as well as misbehavior. And congregations in every age must see themselves as learning communities in which gospel truth has to be taught, defended, and vindicated against corruptions of it and alternatives to it. Being alert to all aspects of the difference between true and false teaching, and of behavior that expresses the truth as distinct from obscuring it, is vital to the church’s health. This definition is useful to all of us regardless of age (as his book is also useful in many ways, regardless of age). I am pleased to announce that the Program Unit on the Pastoral Epistles at the Evangelical Theological Society has been renewed and upgraded to a Study Group. This means we are renewed for six more years of investiagting the Pastoral Epistles together. If you are interested in participating in our dialogue and/or presenting a paper for the study group in the future drop me a line through this site. I am working through Calvin’s sermons on the Pastoral Epistles in preparation for the Reformation Commentary on Scripture volume on the PE and editing a new edition of the English translation of these sermons. Today I came across this strong statement in Calvin’s first sermon on 2 Timothy. As no doubt, if a man reads this epistle diligently he shall find the spirit of God shown to him in this way, and in such majesty and virtue, that whether he wants to or not, he will be as it were ravished with it. As for me, I know I have profited and do daily profit more by this epistle than by any book of the scripture, and if every man will look into it diligently, I doubt not but that he will find the same. And if we desire to have witness of God’s truth pierce through our hearts, we may well keep ourselves here. For a man must be very heavy on sleep, and more than a block if God does not work in him when he hears the doctrine that is drawn out from here. Luther seems almost to say that whatever book of the Bible he is working on is the most important. Calvin though is typically more careful and deliberate with such praise, so this is quite striking. The draft of the schedule for the Annual Meeting of the Evangelical Theological Society has now been posted. I have previously announced the presenters and titles for the new section on the Pastoral Epistles, but now I can post the date, times and location. I am excited about this beginning of our conversation about how the avoidance of the Pastorals has impacted our view of Paul.